Dental implants can be viewed as an artificial replacement for the root of a tooth, but with a different support structure. A natural tooth has a periodontal ligament that retains the root in the bone. 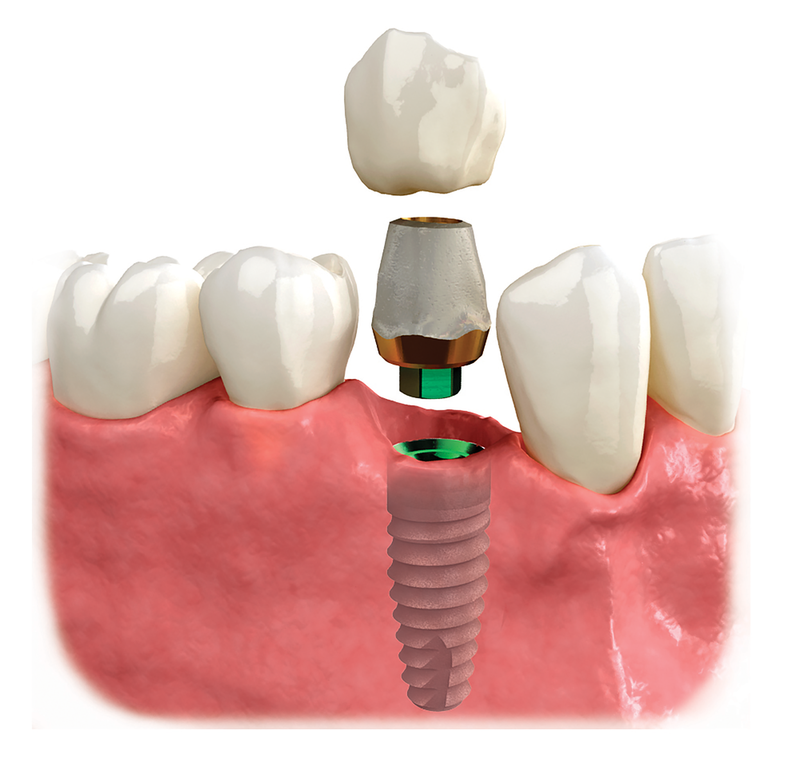 A dental implant is integrated into the bone by biologically attaching the bone to the surface of the implant. This attachment is referred to as “osseointegration”. An implant can be placed immediately or it can be delayed depending on the site and the remaining bone structures. Often, a bone graft is indicated on placement to regenerate missing bone around the implant or to increase the thickness of bone supporting the implant. In the aesthetic zone of the mouth, tissue grafting and bone grafting may be necessary to achieve aesthetic results for the patient. After placement, a fixed temporary can be placed to help support the tissue and to establish an aesthetic, interim appearance for the patient. At times a fixed temporary can’t be placed because of the lack of tissue and/or bone support. In some of these cases, it will be necessary to place a removable temporary, such as a bridge or a removable partial. The final crown or bridge will be support by a custom abutment of titanium, zirconia or a combination of both materials. The abutment is a connection part between the implant fixture and the crown. It supports the contours of the tissue and helps the natural tooth form to the crown and tissue. The final crown can be all ceramic or metal supported for long span bridges. It is the combination of proper implant placement with bone and tissue support and the custom abutment with an aesthetic crown that replaces the natural appearance of the missing tooth or teeth. The Dental Implant Aesthetic Center has its own dental laboratory to fabricate the best design for the abutment and the best aesthetically looking replacement for each tooth. Custom colorization to match existing teeth is performed on all restorations. For the cost of implants, please contact our office for an implant consultation.